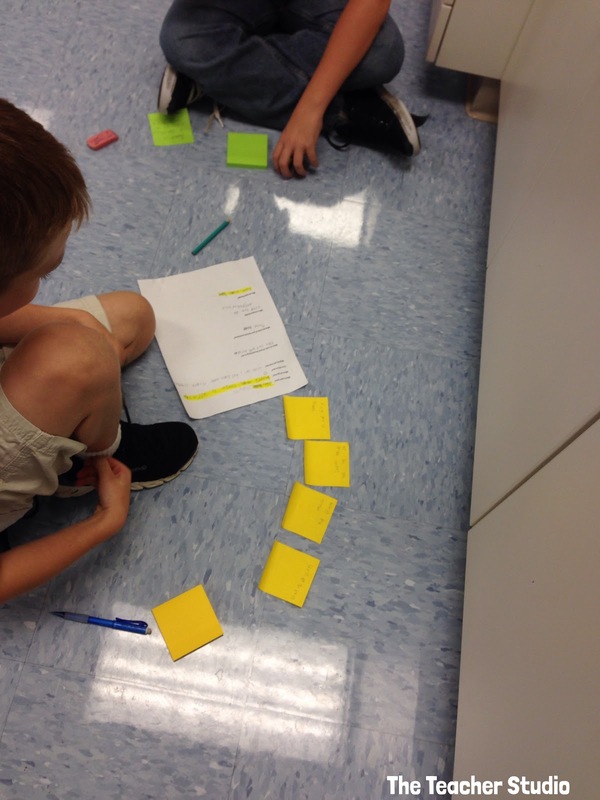 Narrative Writing: Planning and Modeling Pays Off! If you are like me, starting a big writing project is always a little daunting. Students come in at such different levels, with such different skills and interests, and big writing projects are REALLY a lot to manage. So, as we dug into our "realistic fiction" writing unit, I thought I'd share how we got started in case any of these ideas might help you as well! 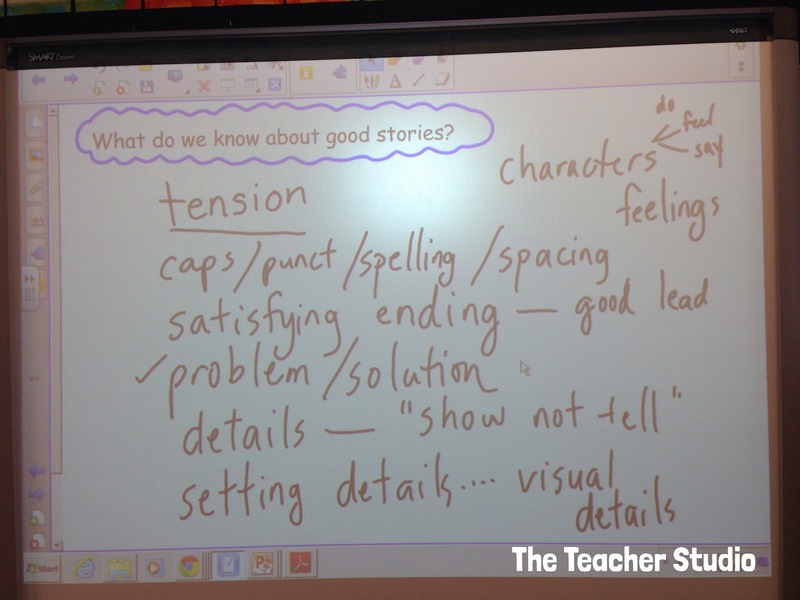 To begin, we went back and studied some of the text we had read and I posed the question, "What do we know about good stories?". We had a great discussion and I recorded some of our ideas on the Smartboard. 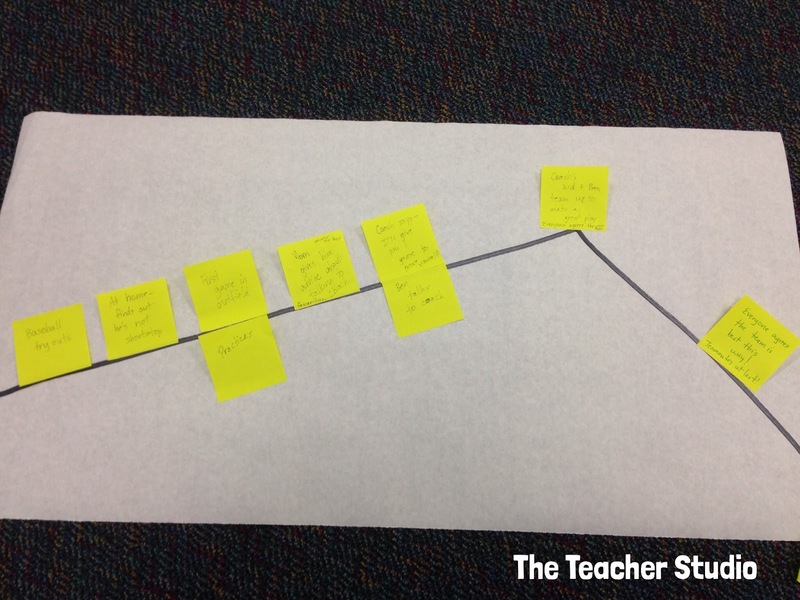 After this, I worked with my students to create a meaningful character. We talked about remembering to remain "experts" in our writing so we all created characters that we could relate to--characters about 10 years old. They first helped ME create a character ("Ben"). We brainstormed his likes, dislikes, his personality, his fears, his habits, and more. By the time we finished, they REALLY knew this character and were ready invent their own--and to select the problem that their character would tackle in their story! Over the next days, I partnered students up to brainstorm their actual "Storyline" and they pitched their ideas to me. I recorded everyone's story line so we can keep ourselves focused! These writing partners will remain together for this entire unit. 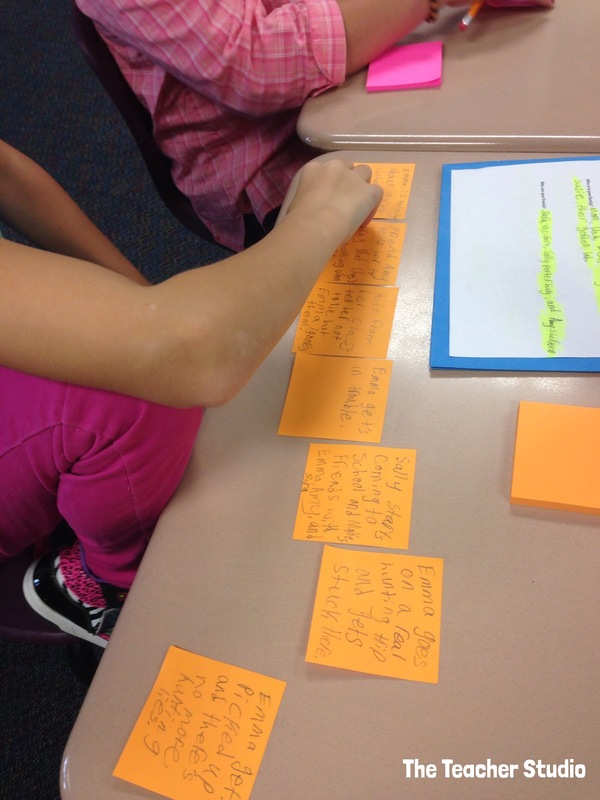 In fact, I told them that they will know three stories really well...mine, their own, and their writing buddy. Over the next days, we learned that good stories are told in "scenes" and we went through our current read aloud, "The Tiger Rising" and tracked the scenes we had encountered in the first 8 chapters. 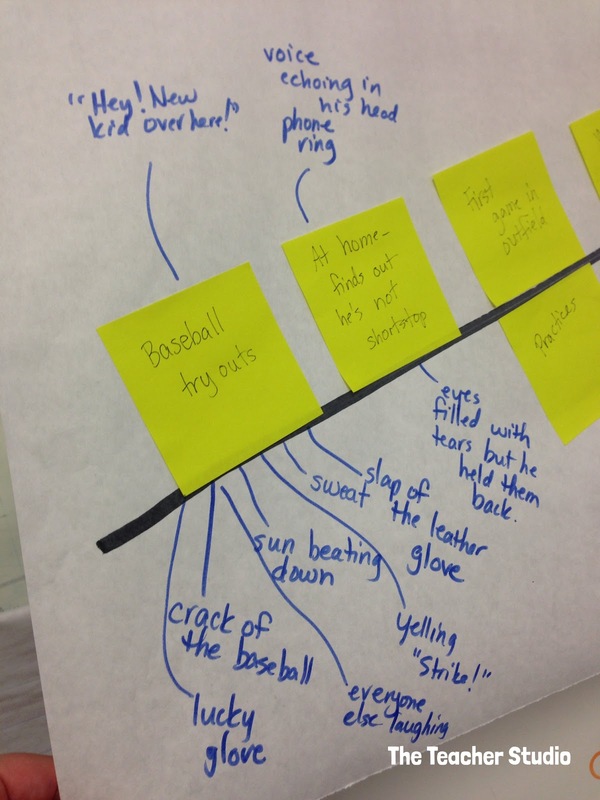 I then had the students help ME create the scenes for our class story about Ben and we marked each scene on a post it. The students then worked with their writing partners to create their own story mountains with key scenes from their story. I really stress knowing how the story will end--that all scenes in the story should lead to that point! As our lessons unfold, we will continue to add to our story mountains. I taught a lesson on sensory details and we then started to add some of those to our class story mountain...because if we get those written into our plan, we are more likely to use them! We have a few more "planning lessons" to go through...using dialogue, creating tension, and "showing not telling", and our plans will be ready to roll! For this project we are drafting on paper, not using technology so I am asking them to use one piece of paper per scene so we can really stretch each scene to help our readers "see" what is happening. Tomorrow, we work as a class to write the first scene of "Ben's story"...and then the students will begin theirs on Tuesday. 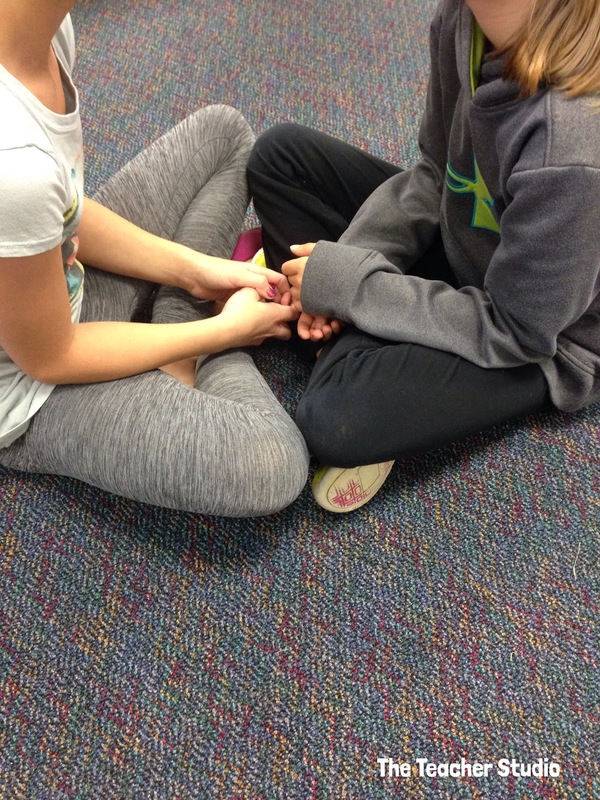 They are SO excited about their own stories--because they have a plan, know what they are doing, and are getting small pieces of new learning to try each day. They may not be perfect when they are finished, but I do think they have a better handle on narrative writing...and they have watched me lead the way. Have a great week, everyone!